MANILA, Philippines – NAPOLCOM EXAM RESULT. The National Police Commission names the passers out of 32,912 examinees of Philippine National Police (PNP) entrance exam, conducted on Sunday, October 21, 2018 in designated testing centers nationwide. The NAPOLCOM exam result was released online on January 9, 2019 or in 2-3 months after the examination. Out of the 32,912 civilian examinees who took the PNP Entrance Examination, a requirement for initial appointment to the rank of Police Officer 1 (PO1), only 3,742 (11.37%) passed the test. Aside from the PNP Entrance Exam, NAPOLCOM also administered the promotional tests to 12,602 hopefuls: Police Officer (PO), Senior Police Officer (SPO), Police Inspector (INSP) and Superintendent (SUPT) exams). "The PNP entrance examination consists of questions on general information, verbal reasoning, quantitative reasoning and logical reasoning," NAPOLCOM Vice-Chairman and Executive Officer Atty. Rogelio T. Casurao said. It is open to all Filipino citizens who are not more than 30 years old and bachelor’s degree holder. In the April 2018 exams, results were announced online after three (3) months. A total of 4,404 out of 30,231 (14.57%) examinees successfully passed the PNP Entrance Exams. The results of the October 2017 exams, meanwhile, were announced within 3-4 months, with partial results on January 15 and full list of passers on January 29. NAPOLCOM named 5,236 out of 28,654 (18.27%) passers of the PNP Entrance Exam. Note that the list of successful examinees will be posted as well at the NAPOLCOM central office located at the DILG-NAPOLCOM Center, NAPOLCOM Bldg., Edsa Corner Quezon Avenue, West Triangle, Quezon City, and can be viewed at the NAPOLCOM website at www.napolcom.gov.ph. Individual reports of rating will be mailed to all examinees. Verification of test results will be entertained at the NAPOLCOM central office and its regional offices nationwide. An examinee who passed the test but did not receive his/her Report of Rating may request for the issuance of certification from the same office, upon payment of P150.00. 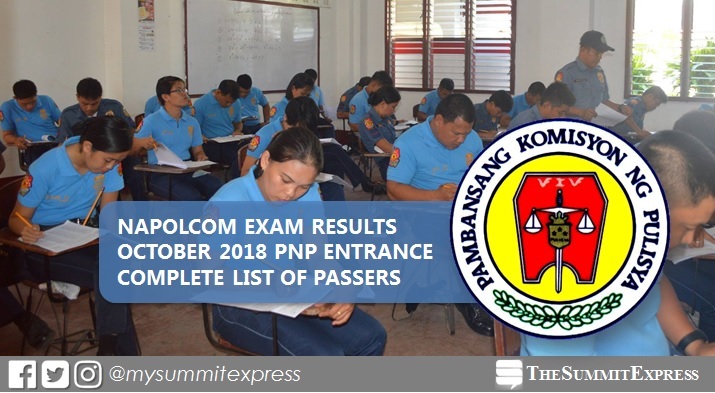 The Summit Express, a reliable news portal in the Philippines, will update this site immediately once we got relevant information on the release of NAPOLCOM exam results.